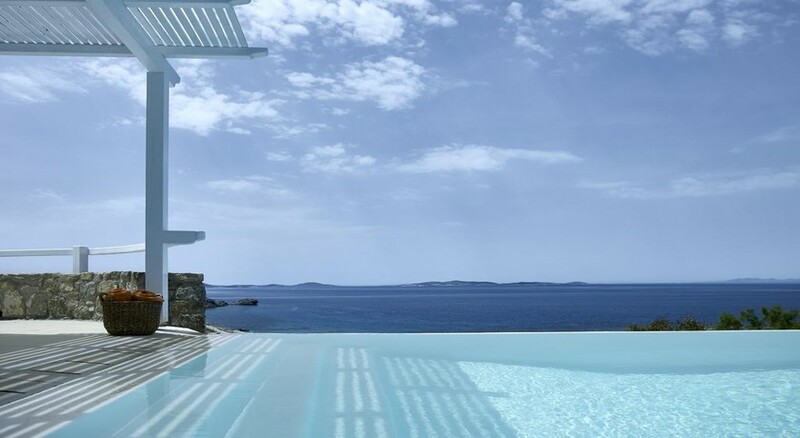 Vibrant Mykonos beckons you to experience the Greek Island way of life at the 4-star San Marco Hotel which enjoys a serene setting in Houlakia Bay in the north-west corner of the island, overlooking the Aegean Sea. Set in landscaped gardens, the San Marco Hotel with traditional whitewashed walls and deep blue wooden shutters presents an authentic Cycladic style of individually designed buildings which contain a total of 84 inviting rooms of varying type to meet your occupancy and budgetary needs. The focus is on your contentment and relaxation here: savour delicious restaurant dishes and gourmet dining, bar refreshment and lighter fare; sparkling swimming pool and spa and fitness facilities. Mykonos town tempts you with its shops, restaurants and nightlife and of course, the history and culture of the region and nearby islands, including Delos. 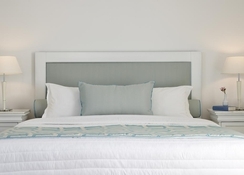 Book into the 4-star San Marco Hotel, kick-off your shoes and enjoy the comfort and style. From the hotel you can catch a bus into town and there are easy ferry and flight connections to the nearby islands, especially Delos, the mainland and transport links to the local beaches. The hotel is 2km from the ferry/cruise ship port and 4km from the main town of Mykonos. Mykonos International Airport is 7.3km from the hotel. 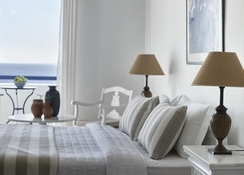 The San Marco Hotel Mykonos features 84 beautifully decorated, spacious guestrooms that are categorised as classic garden view rooms, deluxe side sea view rooms, junior suite side sea view, loft suite maisonette sea view, honeymoon junior suite sea view and executive junior suite. All the rooms come with a balcony that offers unobstructed views of the sea and mountains. Designed to offer comfort, the amenities in all the guestrooms include air conditioning, TV with satellite, en suite with bath amenities, hairdryer, telephone, mini bar and safe deposit. The San Marco Hotel Mykonos houses two restaurants, a pool bar and a lounge. Both the restaurants serve scrumptious meals. The Pythari Restaurant, located next to the pool, serves authentic Greek cuisine. This restaurant serves a buffet breakfast and an a la carte for lunch and dinner. There’s also an impressive wine list. The Veranda Restaurant is an al fresco entity open only for dinner. This gourmet restaurant whips up some incredible dishes that will leave you wanting for more. This restaurant too has an impressive wine list. The pool bar and lounge are the perfect places to have a relaxing drink after a long tiring day of sightseeing. Both establishments serve a wide variety of cocktails, wines, spirits and other alcoholic and non-alcoholic beverages. The San Marco Hotel Mykonos offers an impressive spa experience. There is a plethora of massages and therapies to choose from. There’s also a nail salon and hair salon within the premises. The outdoor swimming pools of the hotel offer spectacular views of the sea. The private beach is perfect to sun bathe and have some family time.